There I was at the Summer Fancy Food Show looking around for something unique when I stumbled upon these two suspicious-looking guys. After taking a look at their sign and impressing them with the proper pronunciation of "Willamette Valley," (just remember it's Willamette damnit!) we struck up a conversation. They had two products they were showcasing -- Oregon White Truffle Oil and Czar's Fine Foods pinot sauces. Both sounded great to me! And it turned out they were - in fact, the sauces were so good, I included them in my five favorite products report from the show. Come to find out the guy I was talking to was Jack Czarnecki, a cookbook author and restauranteur who won a James Beard award for his book entitled, "A Cook's Book of Mushrooms ." Now if that isn't impressive, I don't know what is. And his son, Stefan, was just as entertaining as he was as they shared stories of hunting for truffles by following squirrels in the forests of Oregon. Gosh, that sounds like fun! This was one of those "people get paid to do fun stuff like that?" moments. Anyway, The Czar's Fine Foods sauces made with Pinot Noir wine are spectacular and I used the Pinot Szechuan sauce to make a simple stir-fry. The sauce gave the dish an enjoyable tangy Chinese 5-spice taste with the richness of Pinot Noir. 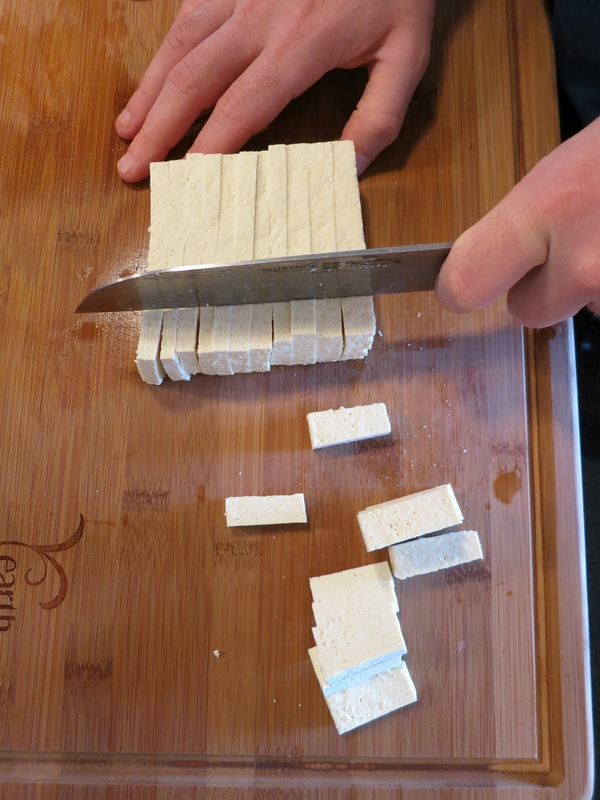 This was my first opportunity to use my new TofuXpress tofu press. This press allows you to press all of the water out of tofu using a spring-loaded mechanism leaving it much firmer. I pressed my tofu for one hour. If you don't have a tofu press, just put the tofu on a plate covered in paper towels and stack other plates and some sort of weight on top and leave it for an hour. In the meantime, slice the vegetables. I started by slicing the bottom of each baby bok choy, which made these pretty little flowers. We didn't use them, we just thought they were pretty. Chop each stalk in half, then chop 1-inch slices all the way up the baby bok choy width-wise. Next, slice the spring onion into thin strips using both the white and green parts. Then, cut the ends off the green beans and chop them in half. Dice the red bell pepper. When the tofu is done, remove it from the TofuXpress press or from the plates and chop into little rectangular pieces. Heat a wok on medium-high heat. Add canola oil, red bell pepper and green beans and cook for 5 minutes. Add the spring onion and cook for another minute. Then, add the baby bok choy and tofu and 2 tablespoons of sauce and cook for another 7 minutes or until the tofu browns and takes up the sauce. Add about half a bottle of sauce at the end and toss. Serve over short grain brown rice for a simple, easy, tasty lunch. 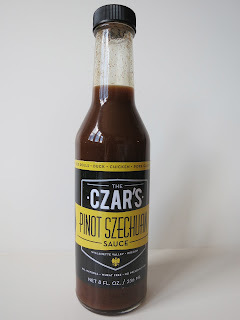 If you can't find these sauces locally, you can order them direct from the Czar himself here.